With today being the tenth anniversary of the issuance of the motu proprio, Summorum Pontificum, it has led me to think back a bit on the history of the movement to restore the usus antiquior within the life of the Church, specifically through the lens of my own personal history in relation to it. That journey, for me, began in the early 1990's. At that time Pope John Paul II's document, Ecclesia Dei Adflicta, was but a few years old. We all know the state of things then and right up until the time of Summorum Pontificum: generosity was prescribed but that prescription was seldom filled. 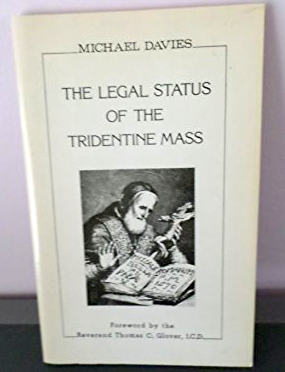 In those years, at least in North America, the "Tridentine Mass," as it was then commonly known, was only rarely available. For myself, it meant a four hour round trip journey to a small country monastery of Carmelite nuns with an even smaller chapel. The monastery was built in the late 1950's and its architectural aura was typical of the cold, drab institutionalism of much of the architecture of that period. The chapel was small and dark -- dingy truth be told -- with walls of unfinished cinder block; it had all the character and charm of a wartime bomb shelter. The Mass was always a Low Mass, there was little other choice then, offered for the good nuns and for a handful of faithful by a charming, faithful old priest who loved the liturgical inheritance of the Church. Because of the distance I wasn't able to go every week, perhaps once a month I would make that trek with the friends who first introduced me to it -- which, funnily enough and with no pre-planning, happened to fall on the feast of St. Pius V. My response to the ancient liturgy in its Low Mass form was one of interest, but not necessarily one of exuberance truth be told -- very much because of the aforementioned limitations and the wearying four hour round trip combined with an early afternoon start time -- and important reminder that things such as place and time do indeed matter. At that time the only related literature available, at least in the English language, were primarily the small booklets written by Michael Davies on various liturgical matters, such as The Legal Status of the Tridentine Mass, which certainly ties into the anniversary Summorum Pontificum, as well as his larger works related to the conciliar reforms -- which, let us recall, were written about as close to the time of those reforms as we are now from Summorum Pontificum; a point easily forgotten. These works are now mainly collector items, speaking primarily to a different time and place in the history of the struggle to revive the rightful place of the ancient Roman rite and in the battle against the hermeneutic of rupture (as we now know it). It was within this milieu that I was presented with a VHS video production of the ancient Roman rite, celebrated a few years before, in 1986, at St. Mary of the Angels, London. The recording included a Solemn Mass, Low Mass and also Solemn Benediction according to the ancient Roman rite -- and it must be remembered that these sorts of things just didn't exist at that time. How this came into my hands was that a member of my local (ordinary form) parish had passed away and the family had brought in various religious goods of her's to the parish to disperse as they saw fit. One of the items was this recording -- which is interesting in its own right because it showed how this interest, this longing, existed even in corners you wouldn't realize. I was on friendly terms with the parish secretary and so she gave it to me -- though with the comment that "she preferred to move forward in [her] faith, not backward" -- perhaps parroting back some saying she had learned in the previous decade or two -- again, such were the times. Regardless, I was grateful for her consideration, thanked her for it and took it home to watch immediately. It was a defining moment. The liturgy, and as importantly the video production itself, was done extraordinarily well. The production quality was high for the time. What's more, the altar and church were beautiful as were the vestments -- a traditional Roman solemn Mass set in green. The Mass setting was Palestrina's Missa Papae Marcelli, sung by a very competent choir. All of this was done in 1986, just two years after the release of the more restrictive Quattuor Abhinc Annos, and still two years prior to Ecclesia Dei Adflicta. To set further context, at the moment in time this was recorded the Priestly Fraternity of St. Peter did not yet exist. Some of this stands as a testament to how much further ahead the movement was in Britain at that time, no doubt partially due to its more condensed geography, partially due to its history in relation to the English Reformation that led to a particularly strong attachment to the ancient rites, partially due to the Agatha Christie indult and, of course, to the good work of the Latin Mass Society of England and Wales. It was a defining moment for me as I say because it was this presentation that propelled me from being a somewhat interested party to a full fledged activist and apologist for the usus antiquior. It might seem strange now that something like a video might have such an affect, but one has to recall what was available to me locally at that time and that in those times generally, Solemn Masses, even the Missa Cantata, were few and far between. In fact a Solemn Mass would have been almost unheard of, at least in much of North America. This recording bridged that gap and shone forth the full beauty of the liturgical tradition of the Roman rite in practice -- perhaps the best and most powerful apologetic there can be. The recording even came with a booklet with the Latin-English text of the recorded liturgies. How important something like this was in those pre-internet, pre-Summorum Pontificum days. To those who put in the time, effort and money to make this production in those early years, they should be commended for their labours and vision. It is probably hard to imagine all of this now admittedly. Today, whether through social media or streaming video sites, one can get a frequent, daily dose of these things from all over the world and in high resolution. What's more, there are numerous publishers who publish all of these liturgical books; the question is no longer where to get them so much as it is which edition to get. A good 'problem.' Most important of all though, the liturgical rites are themselves becoming ever more readily available and in their higher forms; what was once almost unheard of may not yet be 'commonplace' but it is certainly not rare any longer. Things were of course steadily improving as the years passed, with resistance to the ancient rites breaking down, little by little, simply through familiarity. Certainly the establishment of the FSSP and ICRSS, in 1988 and 1990 respectively, was important in this regard. Summorum Pontificum, however, has been the significant difference maker, bringing about a kind of Cambrian explosion liturgically speaking, with a sudden and rapid increase in interest, accessibility and resources related to the usus antiquior. It's advent sees the movement to restore this ancient liturgical patrimony move beyond the infancy of those earlier years. Make no mistake though, there is still growth to occur and with it there are also still growing pains taking place, but the fact they are taking place is entirely good because it is growth that is the cause. The movement faces many more challenges to come, of that I have little doubt; some are new and some not so new, but face them we will all the same. My advice on this the tenth anniversary of the motu proprio, Summorum Pontificum? Reflect back on all that has been accomplished so far and be thankful. Learn from mistakes that might have been made in the past and draw on and amplify the successes going forward. Steep yourself in the tradition, living it day in and day out. Most importantly, and I cannot emphasize this enough: always make your focus in this regard not on what you are against but rather on what you are for; focus not so much on the activity of tearing down as that of building up. That, my friends, is the key to advancing this project further still.